Ecaterina Neacșu-Budacea comes from Moldova, was born in Vaslui and is a teacher of Romanian language and literature. She is married to Cristian, whom she loves for a little bit more than a lifetime and, together, they have a son, Teodor, who never ceases to amaze them as he grows. She is a graduate of the Faculty of Letters of the „Alexandru Ioan Cuza” University of Iași, studies that she complemented with a specialisation in Philology at the same university. She had been working as a teacher, for 20 years, at the „Mihail Kogălniceanu” Theoretical High School of Vaslui. In 2011, she relocated to the Netherlands and, currently, she is part of the Romanian School team, in The Hague. Parallel to this, she collaborates with various cultural and educational publications and web sites. She likes playing with literature with the intention to compile her Dutch experience in a book. She believes that her exiting the Romanian educational system was a mature and conscious decision and she aspires to complete an MA in communication and education at the Rijksuniversiteit of Groningen. She likes reading, and especially re-reading the Russian classics, and she enjoys walking barefoot in the grass covered in morning dew drops. She smiles when she says that she’s the eternal commuter, that she feels forever young, positive and willing to go back to the grind; her smile uncovers the highs and lows of the bridge between the East and the West. I got here in the summer of 2011, at the age of 47, with a solid human legacy, namely my husband, Cristian, and our son, Teodor, who was only 3 years and a half back then. We came in a car with a small trunk, filled with a couple of documents, some clothes, and some books. We settled down – the best word to describe our situation actually – in the attic of my sister’s house, in a little town from Drenthe. We started our diligent practice of floating, in the North Sea, on a boat we held on tight to, only to be pushed ashore, on land, at night time. In the morning, we started all over again. Shortly, I was adopted by my sister’s family and, by coming to the Netherlands, I practiced the therapy of returning to anonymity. The social practice of leading a provincial life – I worked as a teacher of Romanian language and literature for 20 years in a top high school in Vaslui – had turned me into a rather conceited human being, unfit for the cultural model I was trying to fit into. I left Romania because I changed my priorities: I had a child who deserved a second chance. I was not angered by the events in Romania, even if some of them seemed more like a hundred-headed dragon. I couldn’t make out what I was doing wrong, why I could not see a meaningful future for my child. Even today, I’d have a hard time finding an answer to that question. To summarise, I left Romania based on a mature and conscious decision and I didn’t have to hide anything from my past in a closet, under lock and key. I just showed up at the gates of the West and, naturally, expressed that I arrived. And they welcomed me, just as naturally. How was your beginning in this country? 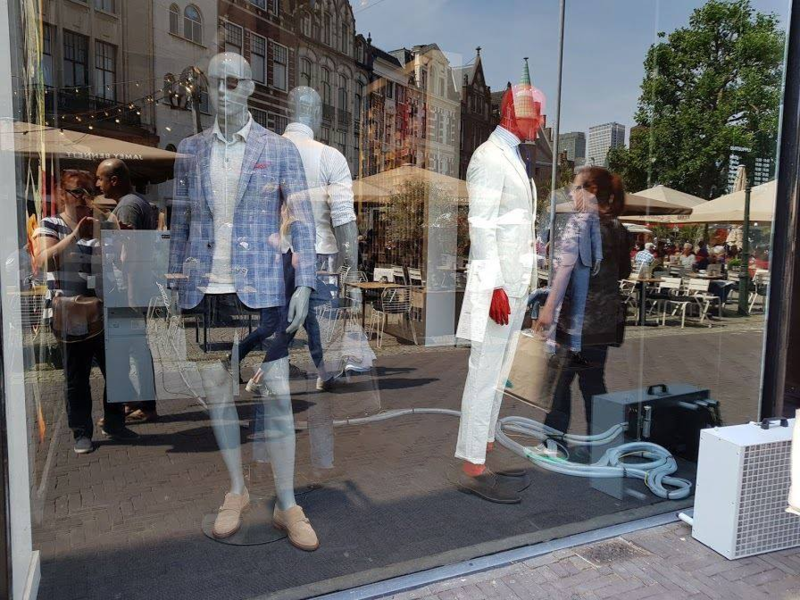 At the beginning, I behaved like a weekend tourist: seeing Amsterdam in its most picturesque landscapes, checking off my list of touristic highlights, Maastricht – impatient to bump into André Rieu at every street corner, without ever being his fan, Giethoorn by boat and its paradise-like outlook. Then, after a couple of months, I was overwhelmed by this feeling that my inner being was invaded by an ever-spreading emptiness. The rain, initially akin to the most refined poetry of nature, started to annoy me and get to my nerves. I knew that, if I didn’t act, I would fall into the chasm of despair so I applied at the French Institute of the Groningen University, Rijksuniversiteit. I carried an older frustration with me, from my younger days: although I got a 10 for my French exam to enter college, I got transferred to the Russian department for reasons that nobody bothered to explain to me. I did three years of French so as to complete a ripe cycle, which led to my neurons being reactivated, just like after a long hibernation sleep. At that time, I couldn’t access Dutch, there was a bridge between us, a bridge that I could climb but could never climb over. It wasn’t like that at all, eventually. How do you look back on all these years since your arrival here? Well, I look very objectively and I either split my sides with laughter recalling many of the errors in my complex process of finding new roots, which would rather spring outwardly than plunge deep into the new ground, or I would be mad at remembering some less fortunate events, especially related to my inability to communicate. The fear to reply or make a phone call so as to solve an administrative problem, for instance. I remember getting a payment notification with a fabulous amount from the financial scarecrow by the name of Belastingdienst (Dutch Tax Office). I was so nervous that I hung up the first time they called me. Second time, I let it be. I spoke, covering my eyes with my hand, as if hiding my shyness; it all turned out OK eventually. I called all my friends afterwards to tell them what I just did, with such pride triggered by fear and uncertainty. Amazing alchemy! Generally speaking, I’m a nostalgic. How do you feel in the Dutch community? I’m going to tell you a story that would also touch upon a lively group portrait of Dutch society, an ethnic profiling as it were. Mrs. Ria, a friend of the singing professor of my son, paid me a visit one day to share the desire of the members of our community to come by our place so as to meet me and my family, for us to socialise and get integrated, so to speak. Then, they came up with the idea that I should join their traditional dance course. I accepted the invitation and, after a couple of days, I showed myself, together with Mrs. Ria, to the locals, some of whom had been here for three or four generations. 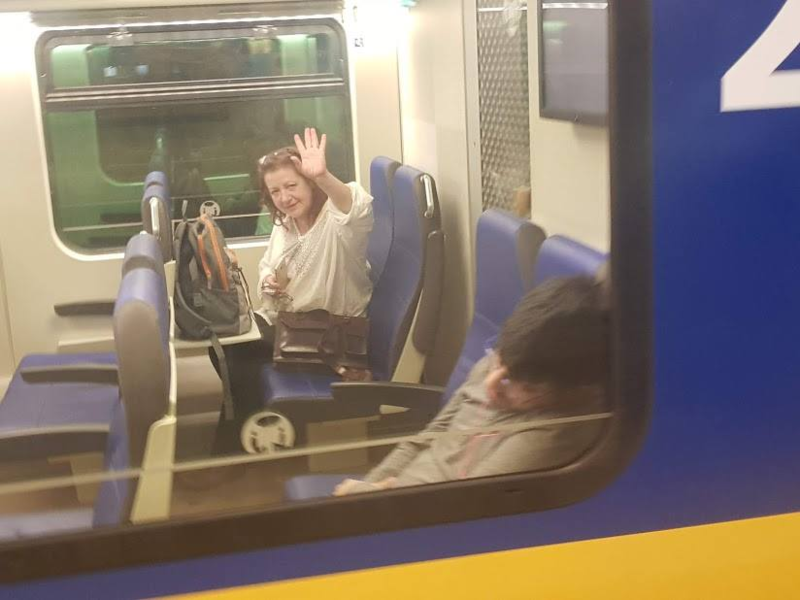 I largely owe the feeling of kind hospitality towards the nomad that I was to that warm, typically Dutch welcoming smile, , that each of these locals shared with me and which I considered, at first, an expression of social hypocrisy in this country. After I told them my name was Ecaterina and got introduced to each of those ladies, we all started to dance at the signal of our teacher. I felt all their eyes on me, but it was just my imagination; I did my best to learn all the steps and let them see my talent and choreographic skills, that I hadn’t been aware of until then. I learned Albanian, Russian, Macedonian steps, we danced holding hands, in pairs, for an hour. After the dance was over, we drank coffee together and I sat next to a 90- year-old woman, a heavy traveller – she was the only one to recognise the Albanian dance – who made the concession to switch to English when my Dutch failed me. I confess that I am fascinated by the civilized behaviour, the lack of prejudices and the desire for an overt life, manifest on any occasion. I am fascinated by the precision in a relationship, the natural way to call things by their name, by grandparents who have all the time in the world for their grandchildren, by elderly people elegantly walking hand in hand. I could say I dislike people giving the cold shoulder, planning any appointment way ahead of time and some other similar things. Yes, I do think that, sometimes, I feel the need to take a deep breath, to put things off, to make things relative, like Eastern people do, to identify myself with Poincaré’s statement: “Que voulez-vous, nous sommes ici aux portes de l’Orient, où tout est pris à la légère.” (What do you want? We are here, at the gates of the East, where nothing is taken seriously.) But it may just as well be my longing for a world I have left behind, without feeling guilty about it. What have you learned from this society? The Dutch world has taught me, above all, that today is the most important day of my life, and that I should cherish it in all its splendour, especially as it draws to a close. I learned to have the courage to think things through and not beat around the bush. Looking at myself in the mirror and bursting out crying in front of the mirror have helped me truly see myself, and this is, in my view, our only chance to fully own ourselves. To start with, I would not equate success and happiness. Success has a social component, if we think of phrases such as „successful business”, „successful person”, and the like. Personally, I see success as a confirmation of our reflexive human potential, innate to us, that drives us to prove ourselves, in general, that we are capable of good deeds for the benefit of our fellow people. Success, in my view, is grounded in authenticity, communication, honesty, and team work ethics. And, especially, moral and intellectual authority. I do believe in success but not to the same extent in “recipes for success”. 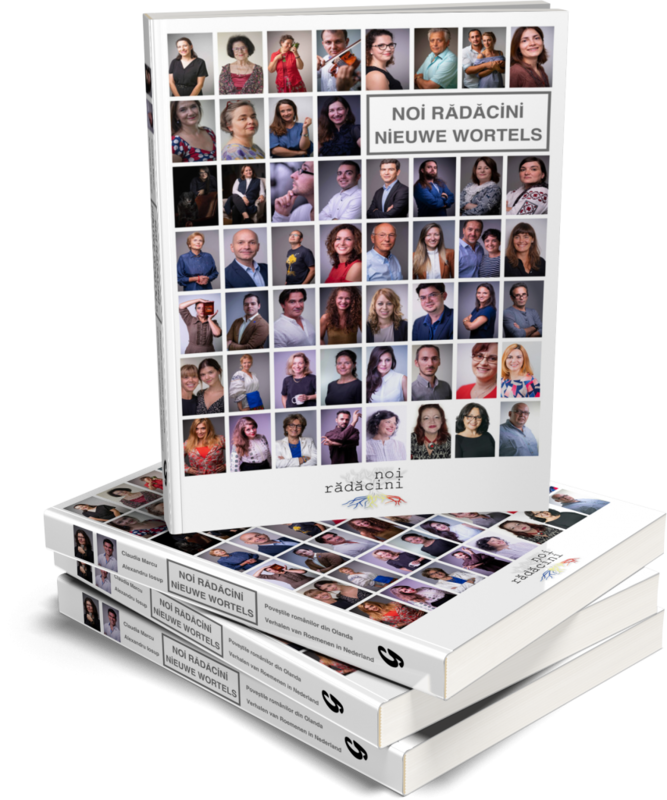 What’s your relationship with the Romanian expat community in The Netherlands? It is my second year with the Romanian School in The Hague. Here, I had the chance and joy to meet driven people, determined to preserve their linguistic and cultural heritage; I am impressed by their effort to extend this to their families and children. While a grown-up can live with a certain cultural abandon, even for a limited period of time, this does not apply to children. That’s why one of the key objectives of the Romanian School is the need to guide children on this journey and make sure they get a thorough training for self-reflection in their adult years. By attending Dutch or international schools, their language of study overrides their mother tongue, and, even if both parents are Romanian, they cannot control this gap. There is here a common factor crucial goal, namely to safeguard your linguistic, historical, and cultural identity in Dutch society; a goal that I try to pursue to the best of my involvement, responsibility, and, most of all, passion. What is your advice to a Romanian who’d like to relocate to The Netherlands? To look at the open door of The Netherlands as the expression of a free world, that demands respect and protection, because it is the guarantee of a better world for generations to come. To rummage through all the hidden corners of the Dutch cultural heritage, learn the language, and discover Rembrandt and Van Gogh in their own home country. And, above all, to learn that the most important day is today, to cherish it in all its splendour, especially as it draws to a close. The Netherlands has its own algorithm that enables you to acquire such teachings.